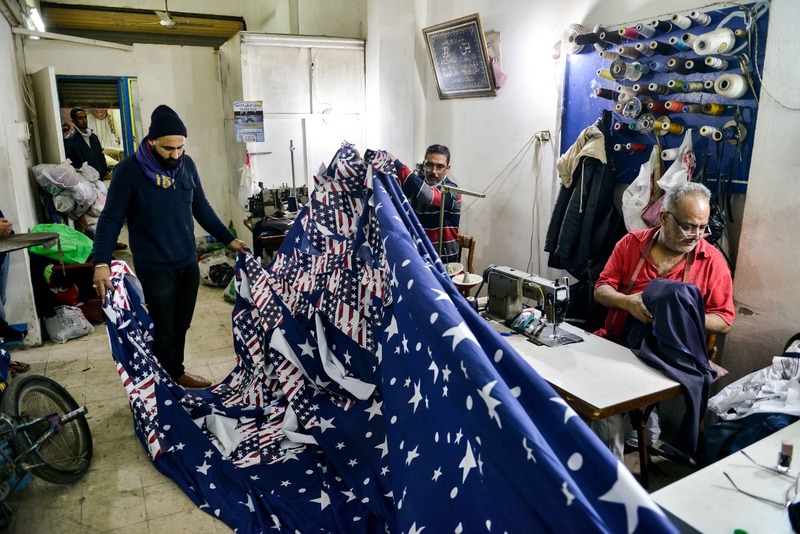 “Does Anybody Leave Heaven?” by Ibrahim Ahmed is an assemblage tapestry made with textile items found in Egyptian street markets, clothing, bags and other items, which are printed with the flag of the United States of America. Ibrahim Ahmed lives in a popular working class area, where most of the social network is composed of young males who have not been able to travel outside Egypt. When explaining in conversation that Ahmed left the US to relocate to Cairo in 2014, he is consistently asked the question, “Does Anybody Leave Heaven?” In the world of his peers, Cairo is a place to escape and the USA is a place to dream about arriving at its shores. The piece presented at the Havana Biennial is a commentary on the constructed mythology and fetishism surrounding the US as a place of desire and opportunity, particularly by underprivileged young males, who have normalized wearing the American flag in the streets of Cairo where popular markets supply this imagery on a variety of wearable products. The installation, hanging across the ceiling, resembles the ceiling paintings in ancient Egyptian temples that are adorned with night skies and yellow stars. Part of Havana Biennial – 12 April to 12 May 2019.